We often do for others that which we desire for ourselves. We give praise and offer affirmations to our children because we deeply desire the same kindness. We devote time to bake cupcakes or volunteer for the shelter because we value acts of service. Maybe we pamper our pets with snuggle time because we need the touch ourselves. I am an elaborate gift giver. I plan gifts often spending time in their creation. I’ve sewn quilts and mail care packages and it may be rooted in my own love of receiving a gift. 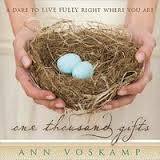 Months ago, my sister gave me a book about gift giving. More so, it is a book about being thankful, that deep, soulful thankfulness that exceeds the platitudes and Miss Manners. It is a tiny book about making a list of 1,000 things but these are the minute, the momentary, the fleeting, the transient beauty that slams into our consciousness and makes us stop. We stop thinking and gasp. And in that breath holding, awe rushes in like a rising tide sluicing through the Lowcountry marsh grasses. Our breath is stolen by the divinity of dappled sunlight on our babies’ heads. It is also stolen at the magic of a healing laceration, the blue Vicryl sutures rick-racking through the skin, piecing together the ragged edges. And skin regrows. We heal. I came home last night unable to hold onto my breath, slammed by the vagaries of The World. I was afraid. The Future loomed up ahead, above, all around me. Cloaked with Fear, I could not see anything but the looming Terror. And the avalanche of questions. What am I going to do? It is so easy to withdrawal when facing this. It is my auto-response. Withdrawal, retreat, regroup and shove away from everyone and snarl at anyone who might approach. My motto: I alone am responsible for this. And I alone can fix it. [read: You made your bed, now lie in it.] The new skill, the new trait, the new practice – for all of life is a practice – is to not retreat but to REACH. So, I reach for my best friend. I reach for my sister. And in those worldly reaches, I can then reach my faith and I turn toward God and realize, I was never alone. And once I get to this place, the awe and wonder and gratitude rushes in. And I can take one of those gasping breathes, gulping in air. You know this gasp. It is the moment you see beauty, when you look upon your loved one when they walk down the aisle or you catch the hummingbird arrive for their morning drink. You breathe IN. You fill your lungs with air. It makes me think of DaVinci’s painting, when God creates Adam by breathing into him and then sets him upon the task of naming things. Wonder and awe. And once I could breath again, the fear diminished. Wonder and awe and ultimately, gratitude slays fear. And I love this phrase, “Slay all day.” Be amazing, be full of wonder, breathe in and be caught in the awe. And think about pulling from a block of marble a statue so precise, so lovely, so realistic, that you know exactly how that kiss feels. You sense the strength in that arm as he holds her. We have amazing gifts bestowed upon us. 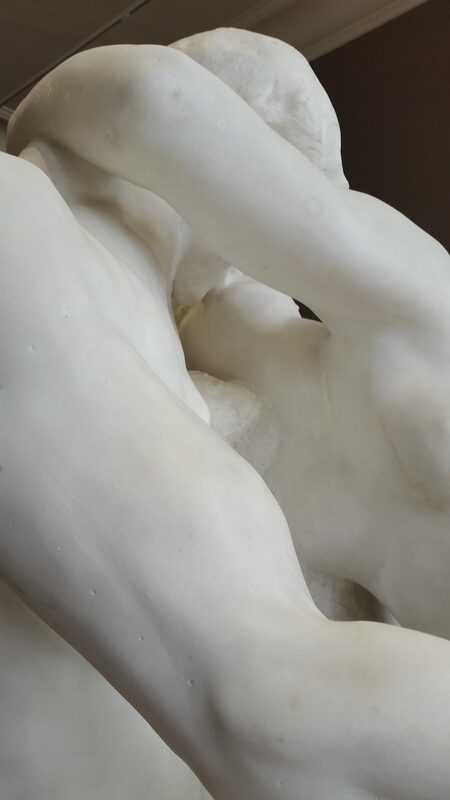 Each of us is Rodin, able to pull from a huge block of marble a masterpiece. Sometimes, that masterpiece is an actual child, knitted in our wombs and born from our bodies and who is now out in the world being (just BEING). Sometimes our masterpiece is a grove of trees planted and pruned, now dropping a harvest of pecans. Sometimes, our masterpiece is hours of service to others in our jobs. The most important gift we give to others is to pause and inhale THEIR masterpieces and give the gift of gratitude for what they have created and maybe in doing this, we can be kinder to ourselves. Life and living it fully is to take one step at a time towards the place we want to be. There is no haste or rush. Just one step at a time. Lovely. Like a breath itself.